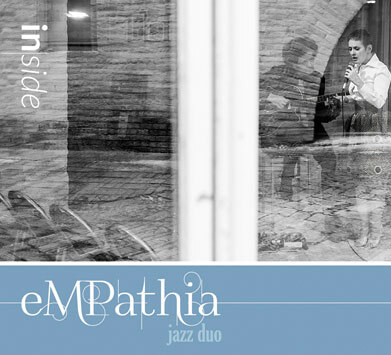 Their musical souls were synchronized on the same wavelength creating the eMPathia Jazz Duo. Today, out of that perfect harmony INSIDE is born, the new album from Mafalda Minnozzi and Paul Ricci. INSIDE is a steady but unstoppable flow of musical atmospheres, in which the Italian interpreter’s athletic voice and the refined technique of the guitarist from New York surprise the listener with the ease with which they approach, elude and chase each other only to meet again. A game! Upon a more careful listening, the plot is revealed as to how Mafalda and Paul have used their imagination and experience to capture what it takes to make their project unmistakeable from any other: INSIDE is such a meticulous patchwork of sensations that come “from within”, cut, sanded and stained by hand to compose a unique sound that surrounds and involves. A patchwork of tonal shades and colors that come by the use of diverse Jazz guitars, baritone guitar and even a detuned wooden resonator guitar in the case of a unique acoustic blues adaptation of Piaf’s “L`Hymne a L’Amour”. A patchwork of lights and shadows, textures in black and white from the high and delicate vocal performance in a Bossa Nova reading of “Citta Vuota” to the muscular and horn like vocal stylings of the funky “Sacumdi, Sacumda” that make it clear to the listener how Mafalda has established herself as a remarkably charismatic and powerful stage performer with a vocal extension and versatile timbral palette that blurs the line between singer and improvisational soloist. In INSIDE, two of Antonio Carlos Jobim’s masterpieces are uncharacteristically treated to a driving beat by Paul Ricci’s guitar on “A Felicidade” and by Mafalda Minnozzi´s spontaneous brillant vocal and percussion ad libs in “Chega de Saudade”. Add to this Morricone, Cole Porter, Rodgers and Hart, Ivan Lins and the CD INSIDE can be summed up as a study in moods and reflections, in feelings and beauty in an honest delivery of two artists creating together exactly as they do when performing onstage. The final virtuosic touch was given by Grammy award winning producer Jeff Jones “The Jedi Master”, who in the heart of the “Big Apple” has captured the acoustic vibrations of the duo in the studio and has preserved them forever in an album with analog warmth that is at once modern and inventive while drawing from the tradition that made these songs eternal!